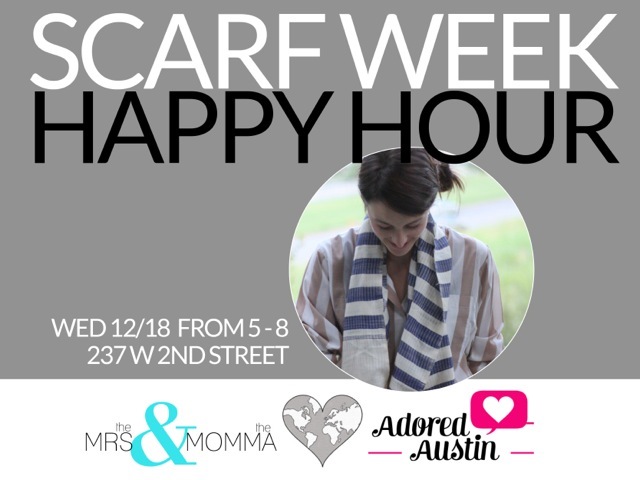 It's Scarf Week at Purse & Clutch // Let's meet! During scarf week, scarves are two for $60 with code "SCARFWEEK" online (regularly $36 each). Every scarf purchased in the shop gets an entry to win either this Ikat Satchel (swoon!) or this new style of Leather Pouchette. Additionally, tomorrow night (Wednesday, December 18), from 5pm- 8pm will be a sip and shop co-hosted by yours truly and the oh-so kind Kristen, of the famed The Mrs. and The Mama blog. There will be Sweet Tea Vodka cocktails on hand, and Jen has stocked the shop full of amazing, affordable, fair trade goodies that will be sure to fulfill those last minute gifts you're scrambling to find. Join us at 237 W. 2nd Street tomorrow night. (Park either in City Hall parking or in AMLI parking garage at 2nd and Lavaca). I would love to meet you! I'll even let you squeal at my very large baby bump. This buffalo plaid black and white scarf is my favorite. Isn't it lovely?